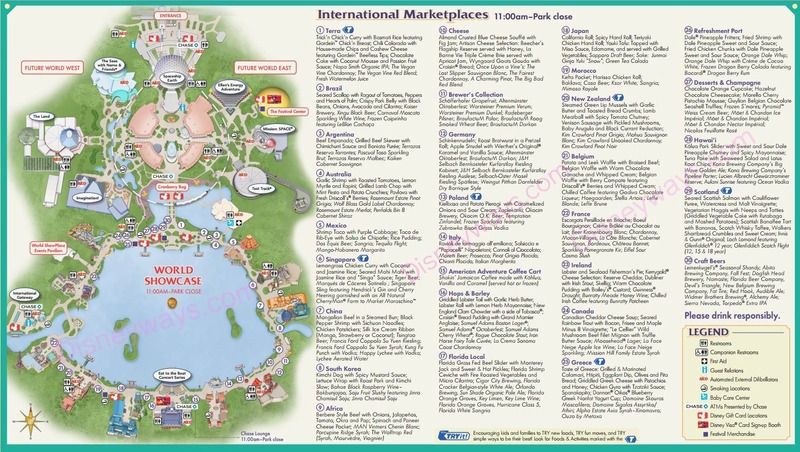 Your 2013 Epcot International Food and Wine Festival map is here! Find all your kiosks, exact locations, menu items and more…all in one place! Just in time! Maybe I was looking at the wrong websites, or just doing it wrong, but I was having a hard time finding a festival map that was large enough to read. The map I created below is from the official Disney website. You can click here to see it in it’s original format – all I did was make it bigger. I was able to get my printer to PRINT this map as well. It even came out all on one page, STILL large enough to read. I hope it does the same for you! Thanks for allowing me to share this with you today. Friends don’t let friends go to food and wine without a plan! Click on the mini-map below to enlarge it…and start planning you way around the world! Cheers! There’s so much to see and explore at this years festival. It’s always a hit with visitors, and this map is super-handy for planning your trip. Stay one step ahead of the crowds! Thanks Alex for your nice comment! So true!